With the death of my mother, Barbara Helm, there is a hole in my heart I fear will never heal. But I always feel better when I go through her old photos and reminiscences and reflect on just how full her life was. Let’s start at the beginning. She was born on August 28, 1924 during the season of O’Bon, a time when the ancestral spirits come back to earth, and families gather to honor them. It was in a tiny hospital in Karuizawa, a vacation community high in the mountains of Nagano, that Barbara found her way into the world. She would have been 93-years-old next week. Picture a high wooden platform draped in red and white banners. An old man wearing a hachimaki, a cloth headband, has the sleeves of his yukata rolled up, and is pounding on two giant taiko drums. A flute player purses her lips as she carries the tune while a singer belts out a local rendition of tanko-bushi, a traditional favorite. As a mother and as a hostess, Mother was an explosion of energy, bubbles of joy, a picture of elegance. She was never happier than when she was at the eye of a storm preparing for a big party or function. Watching Chris and my two sister’s organize today’s event, I think they inherited that gene. She was always directing some major function whether it was organizing a wood-block print sale to raise money for charity or organizing volunteers and donations for a massive school fair. She once persuaded an insurance company to donate several crates of partially damaged dishes so we could set up a booth at a school fair where, for fifty yen, you could enjoy the extreme satisfaction of throwing a pair of baseballs at the dishes and smashing them to smithereens. When times were tough, she made the best of what she had. As a child growing up in Japan, Mom was home-schooled with her brother Roland, and often felt the absence of other children. She insisted her nanny add a phantom student to their lessons. When her tutor would ask Mom a question, she would say to her tutor: “Ask her a question too,” she said, pointing at the empty chair. At age 12 she cried after a major flood swept her house away, not because of the loss of all her belongings, but because her dog died in the disaster. A second home burned down when firebombs rained on Tokyo, and she lost her cat. She suffered her greatest sorrow at 21 when her mother, Annelise, died just after the end of World War II weakened by malnutrition. Her mother had been giving her share of the food to her two children and her husband. Mother learned to be resilient. She reached out and made friends. 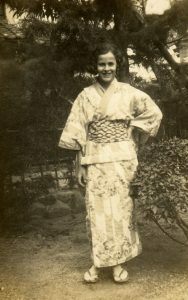 She taught English, translated at the Tokyo war crimes trials and played her own little role in international relations, co-founding the “Inubashi” a group of Germans, Americans and Japanese who, in the aftermath of World War II, traveled around Japan and developed close friendships. At age 49, after my father divorced her, my mother was devastated, but pulled herself together, packed us up and moved us to the bay area to start a new life. She never tried to turn us against our father, often inviting him and his new wife to her new home in Oakland. In Oakland, too, she became the heartbeat of a community of friends and relatives. She hosted five weddings at her house; that of Sayuri and Archie, Marie and me, Patrick and Zoe, Chris and Vickie and finally, her wedding to Torsten, her life’s love and partner. At her memorial, Sayuri share how my mother was the first person she called when her husband died unexpectedly of a heart attack while still in his 40s. Sayuri said her whole body had gone numb. My mother said to Sayuri. “I’m so sorry. But you are going to be OK.” Sayuri said that for the first time she cried. She saw a way forward. Mother loved to help others. She enjoyed her work co-managing English in Action, an organization that connected foreign students and scholars with local residents for English conversation. She was a hostess of the Servas organization, accepting travelers from all over the world into her home. They often called at the last minutes asking for a place to stay. Staying with my mother was like living in a salon where interesting new people were always coming and going. Even in the last 15 years as she slowly lost her mind to dementia, she managed to hold it together. I can still remember the day she swept into my kitchen for a party and announced to everybody present “I just crossed the border into Alzheimers” as if she had just come home from a trip. Mom never got angry or bitter, maintaining her grace in what must have been a world of chaos. I picked her up at the hospital one day after she had had a bout of pneumonia. She told me she had had the most wonderful evening at the hospital. She had woken up in the middle of the night to the sound of voices and clinking glasses. She got out of her hospital bed and walked up the stairs. There she found a huge ballroom filled with people. Someone handed her a glass of champagne and she had a wonderful time. Even her hallucinations were mostly happy. Today we honor Mother amid this season of O’bon, a time of family gatherings—a time to honor our ancestors. But the song is not about pollution. It’s about a prosperity that was keeping hunger at bay. It’s a prosperity whose consequences we must now deal with. But we cannot allow the weight of those troubles to overwhelm us. We must find strength in each other, as Mom always did by reaching out to others. So let us also honor not just Barbara, but all of the loved ones we have lost. Let us give a nod to the ancestors who brought us to where we are today. And Let’s shower hope and best wishes on the young people among us who carry the heavy burden of creating a brighter world for us and all our descendants. Obon is about reconnecting with friends and family. I know the spirit of my mom is among us today and she is enjoying this scene, for once again she has brought us together for a great party.